The pregnant female victim was walking home from work when a subject approached her from the rear and without warning, punched her in the head, 3-4 times, knocking her to the ground. The woman told the subject that she was six months pregnant so that he wouldn’t hurt her, or the baby. The subject replied that he didn’t care as he took property from her purse and fled. She was taken to a hospital, examined and released. She came to my office and worked with me to create the sketch. Upon e-mailing it to the detective, he immediately recognized the subject. He was arrested and jailed after the victim identified him in a line-up. 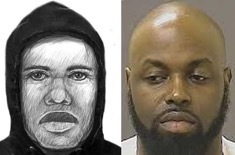 The depicted subject was suspected in a series of robberies occurring in and around the city of Baltimore, including Baltimore County. In most of the cases, he wore a mask to cover his face and disguise his appearance. He became careless though, because in this case, he entered a sandwich shop, uncovered, to purchase two sandwiches. He returned moments later and robbed the business at gunpoint after ordering two sodas. The subject fled and was later arrested after the discovery of a fingerprint he left behind at a crime scene. This was my first, remote, virtual composite interview. It was a bit clumsy at first, because I was not used to the software and other mechanics, including the use of a translator. But, the results proved to me that it could be done and it became the precursor to the service I offer the department today. Two friends were walking down the street when they were approached by two subjects, one from the front and the other from behind. They first asked the victims if they had marijuana. When they answered, “no”, one subject brandished a handgun and demanded their cell phones. For about twenty minutes after, they all walked around the neighborhood as the subjects continually asked them where they could buy some ‘weed’. When the victims replied that they didn’t know, the subjects fled with their phones. The victims came to my office later to help create sketches. They were longtime friends and a couple of characters themselves who kept me entertained throughout the interview. A mother and daughter were enjoying a meal inside a fast-food restaurant, when the subject approached their booth. He brandished a handgun and demanded money. When the mother refused, he struck her over the head with the gun. Luckily, it was a cheap, plastic replica that shattered on impact. She was not injured and the subject fled, empty-handed. She worked with me to create the sketch that later led to the subject’s arrest when he was recognized by a district patrol officer. Detectives were investigating an armed robbery. They later learned that one of the subjects was attempting make cash withdrawals at local ATM’s using the victim’s card. Unfortunately, the victim was not able to describe the subject. 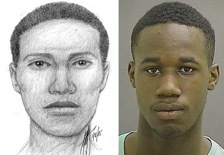 Detective did have surveillance footage from an ATM camera that they asked me to convert to a composite sketch. It took some time, but the subject was later identified and arrested for the robbery. The subject robbed several businesses using a syringe and needle. During the robberies, he brandished a fluid-filled syringe that he told victims was tainted with the AIDS virus. Fearing infection, his victims gave him the money he demanded. 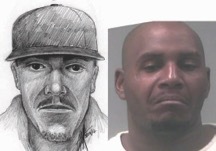 The sketch was developed with the help of eyewitnesses resulting in the arrest of the suspect. A woman stopped at the post office, leaving her 7-year old son and her purse inside the vehicle. An unknown male subject walked up to the car and reached inside to grab the purse. The child instinctively grabbed onto the purse and a wrestling match followed. The subject was successful in taking the purse before he jumped into a vehicle, driven by a female accomplice, and fled before deputies arrived. The child’s mother witnessed the incident as she was walking out of the post office and was able to help create the composite sketch. the robber who fled on foot across the parking lot. Responding officers conducted an area search, aided by a sheriff’s bloodhound, but they were unable to located the subject. They did find a stolen vehicle nearby with its engine running that they believed was the subject’s escape vehicle. Luckily, the officer was not injured and was able to help me create a sketch of the subject who was later identified and arrested.